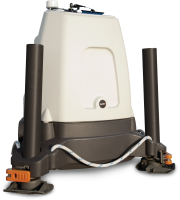 LOGAN, Utah – Campbell Scientific, Inc., has announced the selection of the ZephIR 300 wind lidar as the company’s remote sensing solution for providing the US wind energy market with accurate wind data across all stages of a wind farm development project. Manufactured by Zephir Ltd. of the UK, a subsidiary of renewable energy group Natural Power, the ZephIR 300 provides remote resource measurements of wind quality and characteristics from 10 meters (30 feet) up to 200 meters (650 feet) above ground level. It has demonstrated high-quality measurements across many hundreds of installations in a range of scenarios and environments, enabling Campbell Scientific to add the product to their portfolio of quality solutions. Campbell Scientific will partner with Zephir Ltd. to act as an authorized distributor for the ZephIR 300 in North America. Since 1974, Campbell Scientific has created a well-known reputation for their reliable data acquisition systems, and the company is committed to satisfying the instrumentation needs of customers, especially those who are working to advance science and technology for the benefit of humankind. Campbell Scientific data acquisition systems are used worldwide in the wind energy industry and are known for their versatility, precision, and dependability–even in harsh, remote environments. Campbell Scientific, Inc., is a worldwide manufacturer of dataloggers, data acquisition systems, and measurement and control products. To learn more about Campbell Scientific, Inc., or to ask questions of the company’s highly trained technical and sales support team, please visit www.campbellsci.com.